Get Connected. Get Integrated. Get Automation. Using a Moxa Ethernet to Serial conversion box, we can communicate to TS controllers via Ethernet TCP/IP from PCs. The TS series controller uses a very simple ASCII communication protocol that is compatible with PC environments, such as .NET, VB, C++, Java, etc. 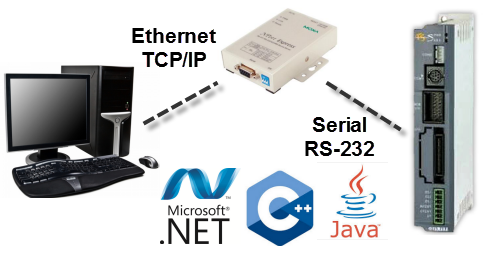 A serial RS-232 connection is required between the Moxa device and the TS series controller via the programming port. A standard TS programming cable is used. TS series controllers can be linked together via an optional daisy chain cable. Up to 16 single axis controllers can be linked via a single RS-232 port from the Moxa or a PC.